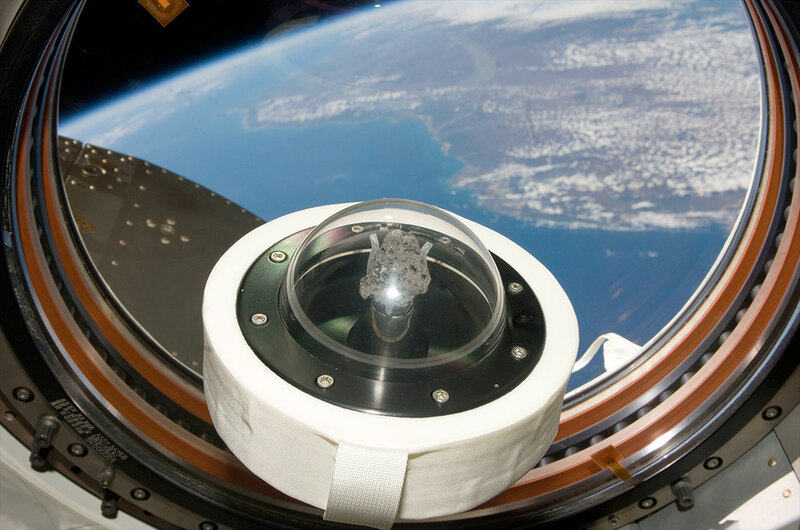 — A moon rock, which is currently onboard the International Space Station (ISS) to mark the 40th anniversary of the first manned lunar landing on July 20, 1969, will return to Earth at the end of this month to await its next mission: the United States' next trip to the Moon. The 21 gram (0.7 oz) moon rock, which as collectSPACE first reported was secretly launched to the space station in March 2009, was ultimately revealed by NASA during a celebration of the Apollo program held 40 years to the day after Neil Armstrong scooped the lunar sample from the Moon's surface for its return to Earth. 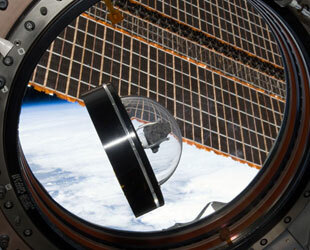 Appearing at the National Air and Space Museum-hosted event through a pre-recorded downlinked video, ISS Expedition 20 flight engineer Michael Barratt debuted the moon rock before the invited audience, which included Armstrong and his Apollo 11 crewmates Buzz Aldrin and Michael Collins. 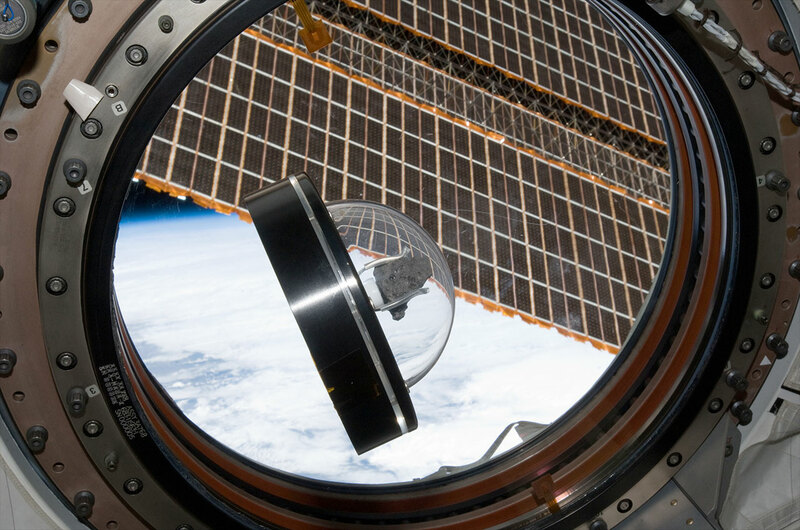 "This rock was brought by the space shuttle Discovery here, to the International Space Station, the first stop in America's return to the Moon," said Barratt while floating inside the station's Harmony module. "It was brought here as a symbol of NASA's resolve to successfully carry out America's plan to build a new generation of spacecraft for a new generation of explorers." Under NASA's current plans, Orion capsules will liftoff on Ares I rockets with four astronauts destined for the space station or other destinations, including the Moon. In May, President Barack Obama commissioned an independent review of those plans, which call for humans to be back on the Moon in the 2020 timeframe, with the results due out this September. 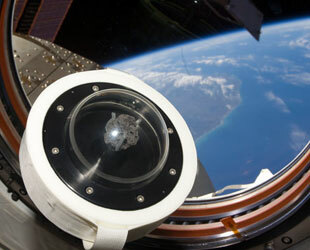 The moon rock will return to Earth before then, aboard the space shuttle currently docked with the ISS. Endeavour and its STS-127 crew are presently slated to return to Earth on July 31, after which the rock will go on display to remind NASA's workforce "what can be achieved with innovation and sheer will," said Barratt. "This rock will also be displayed around the country to serve as a symbol for all Americans of the fortitude of our nation as we press forward in space," he added. Ultimately though, the lunar basalt, or lava, rock's display will be biding the time for its next launch. "When Americans return to the Moon, a piece of this rock will go with them to be returned to its home," announced Barratt from aboard the ISS. "It is an important reminder that America's committment to human exploration did not end with the twelve astronauts who walked on the lunar surface. Apollo was just the beginning."